As the Multimedia and Marketing Manager, I play a leadership role and am charged with providing a high-level vision in the development of the University’s marketing and recruitment strategy, as well as ensuring consistent delivery of all branding, marketing and strategic communication efforts. 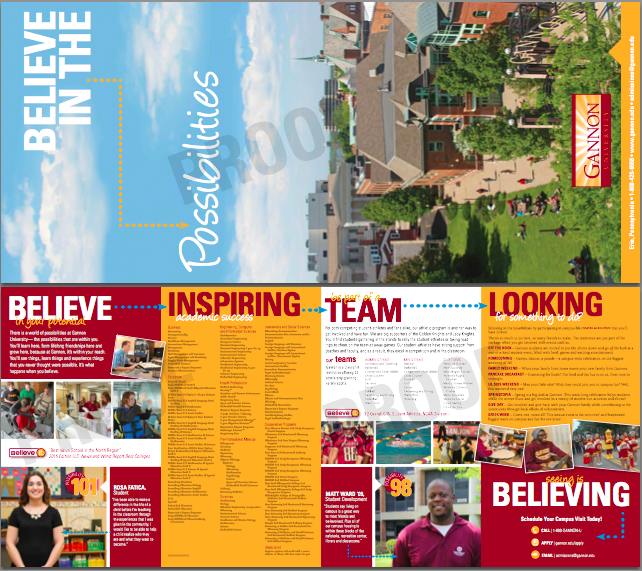 In this position, I work collaboratively with all Gannon University entities to fully integrate and advance institutional marketing, branding and communications efforts, both internally and externally. A primary goal of my position is to help Gannon University realize its enrollment and philanthropic goals by advancing an enhanced image of the University regionally, nationally, and beyond, as a premiere institution that prepares academically talented students to achieve success. 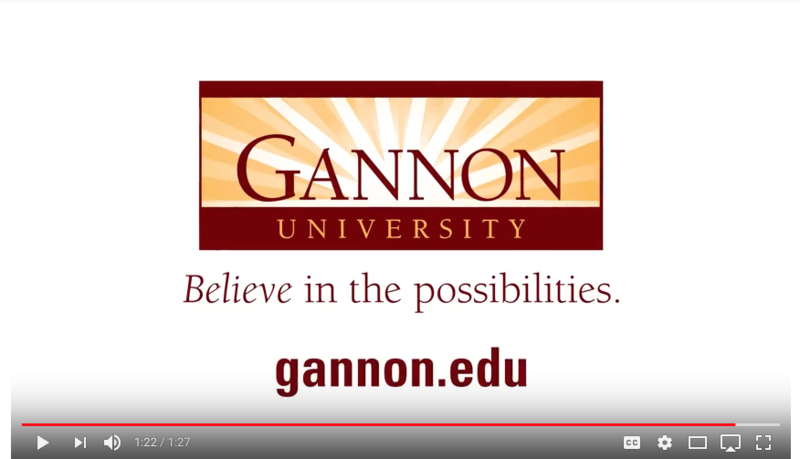 The effective result of these efforts will contribute to: increasing the diversity and quality of Gannon’s undergraduate, graduate and global populations; raising the visibility of Gannon and the accomplishments of its students, faculty and staff, building alumni engagement in the future of the University, as well as establishing Gannon as a vital resource locally, regionally, and nationally. Gannon had its largest freshman class since 1986 this past fall of 2018. Excelling in a fast-paced, deadline-driven work environment, it is my responsibility to oversee the marketing and multimedia activities that impact University enrollment and advancement and increase the public’s interest in the University’s programs and offerings. Utilizing various media technologies, I develop strategic marketing efforts to best convey the University brand to target audiences by working directly with clients to align their goals with the goals of the University. I am also responsible for being an expert in executing events. I effectively mobilize cross-divisional collaboration to ensure the best possible outcome and experience for our attendees. I am a key player for these events often acting as lead while coordinating with multiple departments including dining services, academics affairs, maintenance and others. Some of our signature events include Commencement Ceremonies, Dedication and Blessings, Business After Hours, community engagement events and meetings. To optimize communication between such a diverse group of people, we have implemented processes and procedures surrounding events such as Event Check Lists and ToolKits, which are easy to read instruction kits on best practices for event management. I also oversee two departments: the Gannon Press, a full-service, in-house print shop, and Distribution Services, a USPS location. In this roll, I have generated additional revenue for the University through solicitation of external print projects from outside the University and have established the Gannon Press and Distribution Services as profit centers for the University. Created a formal integrated communications and marketing vision that promotes the University’s public identity. Engaged administrators, faculty, students and alumni in discussions about the vision, incorporating feedback and introducing processes for its consistent application across the University. Plan, develop, implement and manage strategic design of marketing initiatives in assigned areas such as, but not limited to, recruitment and academic affairs, events, publications, communication, web, marketing research, social media, and advertising. 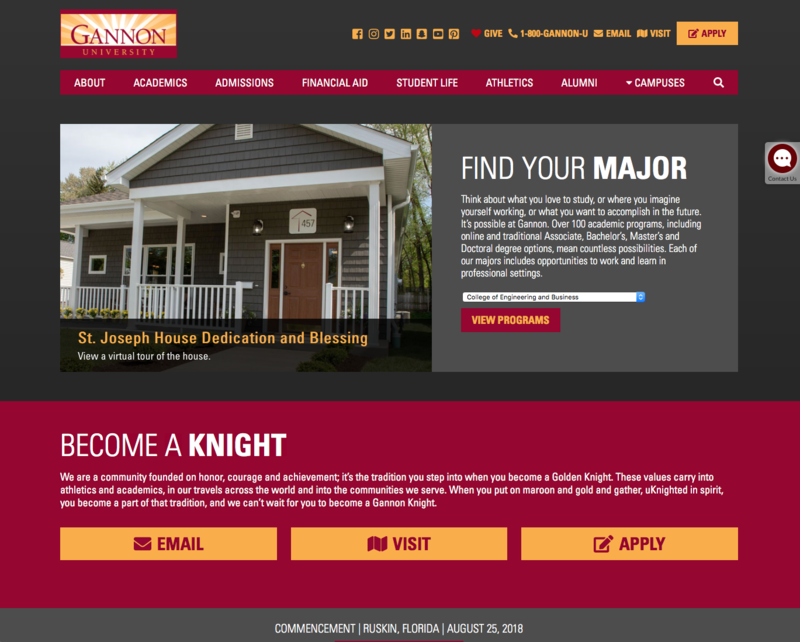 Based on market research, data and the expressed needs of the University, formulate and articulate a strategic marketing and communications vision for messaging, branding and strategies that enhance the overall University goals in enrollment, alumni engagement, fundraising, volunteerism and pride in Gannon University. Develops annual and long-term plans to meet marketing objectives. Intentionally collaborate with third-party and external vendors to maintain brand integrity and enhance marketing and recruitment effectiveness; negotiates with these entities to secure competitive prices for paid support services. Assists and coordinates with the Multimedia Specialist for the University’s video and multimedia needs in support of the Mission. Manages and coordinates the Gannon Press and Distribution Services’ marketing and print production services, including leading a professional staff and directing their day-to-day activities to ensure efficiencies, establish processes and manage strategic operations. 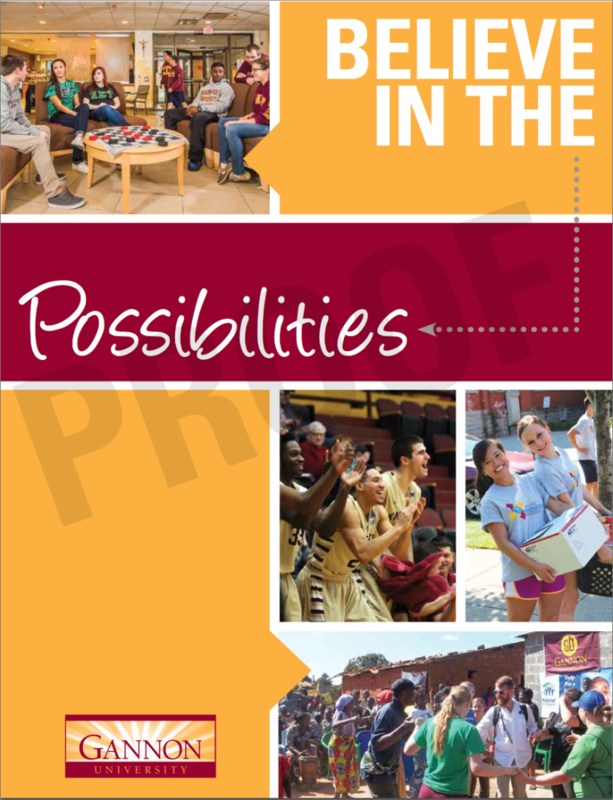 Generates additional revenue for the University through solicitation of external print projects from outside the University and establish the Gannon Press and Distribution Services as profit centers for the University. Assists the Social Media Specialist with the development and implementation of the social media strategy and calendar for the college and works with other members of the department to ensure optimal utilization of social networking vehicles. In partnership with the Chief Marketing and Communications Officer, identify and meet/exceed stated personal performance goals that will align with the Divison’s strategy and University goals; understand the importance of aligning action with overall University strategy. I have the bility to be a proactive sales professional with a proven track record of developing new business, closing sales, maintaining a high client retention rate and growing existing accounts. Provides leadership and representation to various college strategic committees and taskforces with respect to specific marketing and communications programs, projects and issues. Support crisis communication efforts and reputation management of the University. As the Marketing & Communications Specialist, I provide marketing strategy with a consultative approach to students and all classifications of faculty, staff and administration at Gannon University, government agencies, vendors, media representatives, and the general public. Plan, develop, implement and manage strategic design of marketing initiatives. Develop and maintain professional contacts and affiliations with representatives of local, regional, national, and international media to promote the dissemination of news and publicity related to assigned areas; develops and writes news releases as appropriate. Support crisis communication efforts, and serves as spokesperson as needed. Assists and manages the University Media, Marketing & Communications Writer with writing for the University’s publications, press releases, public relations advertising copy, media relations, social media, fact sheets, Webpages, emails and other items as needed. Explains to customers how specific types of advertising will help promote their products or services in the most effective way possible. Event management: schedules, coordinates, implements and works all events related to areas of responsibility. Provides weekly updates to the Director for Marketing and Communications on marketing efforts, achievements, challenges and expenditures. Assist in leading sales team to develop and implement Marketing and Sales action plans to increase revenue for eight hotel brands, seven restaurant chains, the Ambassador Center, Splash Lagoon Indoor Water Park & Resort and Peek’n Peak Resort & Spa. Developed new business in Pennsylvania and Western New York and increased customer base by at a least 25% in the past 2 years.Top Marketing and Sales achiever for client retention of 75% of Scott Enterprise’s Top 10 Account (producing $1M per year). Awarded 2011 Top Revenue Producer. Consistently close a quarter million dollars in consumed room night and event revenue each quarter due to an ephasis on target marketing.Additional revenue is generated through off-site catering, restaurant sales, Splash Lagoon consignment ticket sales, golf tournaments and ski events. Assist in writing content and the creation of other materials promoting company events and initiatives, under deadline. Successfully partner with non-profit clients to develop, promote, market and produce fundraising events. Secure sponsorship sales for company driven sales and marketing initiatives. Create individual marketing and sales strategies for specific market events that include visually promoting the image, products and services through event booth design, marketing materials and signage and through networking. Consistently represent Scott Enterprise to prospective clients with a high level of integrity and professionalism. Continually targeting and prospecting for new business through outside sales calls, site visits, target market client events, telemarketing, individual creativity and innovation. Cultivate and maintain effective relationships with decision makers of orgnaizations, associations, social groups, non-profits and government entities to solve customer probems, meet committments, seek customer input and anticipate customer needs. Able to present Scott Enterprise’s brand and facilities to a wide array of audiences. Efficient at determining demand potential and presenting features/benefits that match the needs of the client. Gaining “next step” commitment or “closing”. Participate in effective crisis communication between conference center, hotels, resorts and public. Recognized for exceptional performance within the company-wide cross marketing program. Attend and represent the company at industry events, trade shows, community partner events, networking events and company hosted events. Work with local universities and colleges to create and market Alumni events, special events and promotions for students and faculty, and experiencial learning opportunities. Part of the Opening Team responsible for winning Hotel of the Year for Sheraton Erie Bayfront Hotel. Created developed and implemented promotional events, packages and special events. Responsible for grass roots marketing and public relations to announce the hotel opening in order to secure a base business. Responsible for requests for information and coordinating ribbon cutting/opening ceremonies with local government, corporate and media outlets for event. Leveraged competitive information to understand competitor offerings and to make recommendations to Corporate and Brand management teams in understanding the local community regarding marketing activities. Utilized social media to position Sheraton Erie Bayfront as the premier hotel for Erie by monitoring and posting responses to ensure all content. Solicitation, development and maintenance of accounts in the following markets: Weddings, Social programs and events and Corporate markets. Conducted selling activities in accordance with sales activity and room night production goals. Detail manager for catering functions; maintains proper execution of event. Maintained quality care for customers and staff; constantly retaining a positive attitude during hectic times as well as using the ability to multitask. Able to resolve issues before problems arise. On-call 24 hours/day. Able to implement up-selling tactics as well as to encourage the sale of promotions, product and special events. Completed both Starwood and White Lodging Management comprehensive training programs. Promoted to Director of Sales & Marketing from within the company after 2 years. Responsible for generating top line revenue and the management of all marketing efforts. Develop and implement monthly and annually sales action plans. Insures that the sales department team members achieve their sales activity and room night production goals. Can manage and lead a sales team. Establishes department objectives with General Manager. Monitors progress against hotel and department objectives throughout the year by reviewing all relevant daily reports. Effectively conduct market research, market segment tracking and competition analyses. Monitor market penetration and assesses hotel position in marketplace. Maintain active involvement in community and industry organizations. Hired, trained, supervised and perfomed evaluations of staff. Maintain communication with competitive hotels, Visit Erie and Chamber of Commerce. Solicitation, development and maintenance of accounts in the following markets: Weddings, Social programs and events, Athletics, Conference and Corporate markets. Develop innovative aggressive sales solicitation programs on an on-going basis. Cold calls, tours, marketing campaigns and community involvement & participation. Sought new opportunities and had the foresight to recognizing soft periods and act accordingly. Create mini-marketing & action plans, direct mail campaigns, solicitation programs and menu packaging on an on-going basis. Support operations to insure all communication is received in compliance to guest's requests for guest room blocks, guarantees and banquet events. Act as the liaison between guest requests and outside vendors. Support and promote a positive, professional work environment enabling all to initiate teamwork and quick decision making processes using poise and effectiveness under high pressure situations. Attention to detail is immaculate. Graphic Design and Publication work as needed. Quarterly newsletter, The Achiever: From date of hire, expanded the newsletter from four (4) to eight (8) pages. 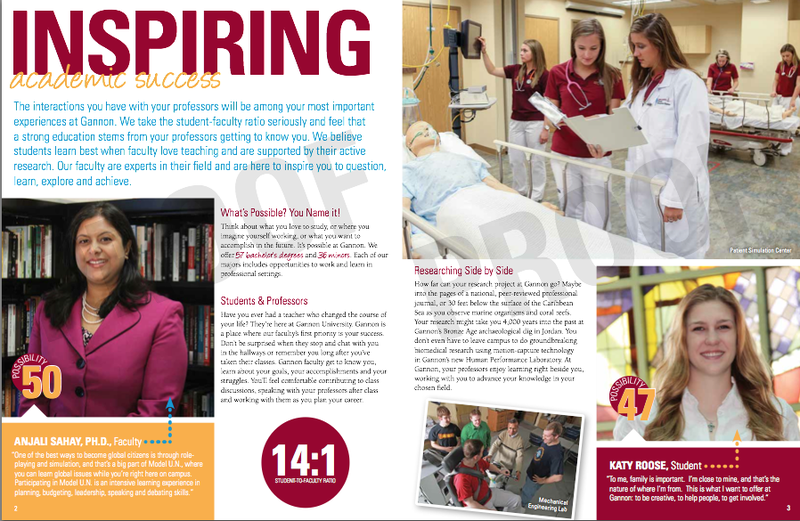 Initiated interviews, meetings and departmental pieces thus creating a more balanced and creative newsletter. Brochures: Responsible for the creation of all agency brochures including departmental pieces and summer programs; liaison between the printer and the agency. Annual Campaign: Spearheaded annual giving from theme development to creation of brochure through direct mail and follow-up. Events: Trail of Treats, Trivia Night, Annual Luncheon. Responsibilities included the creation and production of all invitations, brochures, flyers and advertisement material; cultivation of sponsorship and silent auction contacts in Erie and Pittsburgh, PA, as well as, Chautauqua County, NY. Community awareness through press releases on both television and radio. Brought in Verizon Wireless as a major sponsor for Trivia Night within my first few weeks of hire. Annual Report: Completed layout and design, initiated interviews and follow-up conversations, as well as, signed consent forms from all families involved in publication. Handled all communication between Resource Development department and agency departments in order to have accurate and updated information and photographs. Acting photographer for agency. Expanded from six (6) to thirty-six (36) pages. Volunteer Coordinator: Active member of Pennsylvania Association of Volunteers (PAV). Position: Nomination Committee Chair - assisted in program to recruit, train and motivate new and existing volunteers. Assisted with Grant Writing and Research. Maintain donor database while bringing in new constituents. Responsible for all direct mailings. Monday Morning Memo. Wrote the agency memo each week keeping all staff up-to-date on agency happenings. Solicitation, development and maintenance of accounts in the following markets: Travel & Tour (motor coach), Athletics, Small Meetings-Groups, Social programs and events. Generate business within these markets in a profitable manner while maintaining a database of clients, all current correspondences and activities. Served as the liaison between those markets and Scott Enterprises. Supervised assistant in administrative duties. Extreme team player able to work independently, meeting position requirements, without constant supervision while displaying a high level of professionalism, enthusiasm and customer service to both outside clients and coworkers. The ATHENA Leadership Model identifies eight distinct attributes that are reflective of women's contributions to leadership: Authentic Self, Relationships, Giving Back, Collaboration, Courageous Acts, Learning, Fierce Advocacy, Celebration and Joy. These personal traits that are more intuitive to women and combined with the strongest aspects of traditional leadership-taking risks, assertiveness, hard work-prepare women to be successful leaders in the 21st century. These annual luncheons bring together emerging and established women leaders in the community across several disciplines including: government, small and large business, educational and nonprofit sectors to network and create a bond of lasting partnerships. Responsible for the event management efforts of the conference and assists in ways to enhance the outcome. The mission of the Women in Leadership Development (W.I.L.D.) Conference is to empower professional and enterprising women with knowledge, energy and passion. The W.I.L.D., founded in 2008 by the Gannon University SBDC, is a celebration that recognizes; supports and promotes women in business through women helping women. This concept of connectivity is achieved by encouraging networking, providing leadership opportunities and supporting each other. Instrumental in the planning, promotion, marketing and overall decision making for the conference to ensure its success each year. Successfully executed the registration process for the past 2 years. Responsible for the solicitation of new exhibitors and the retention of existing exhibitors. Hosted the WILD event at the Ambassador Center in 2009. Promote Erie and attract young professionals to our area. Athena PowerLink is being provided by the Erie Regional Chamber & Growth Partnership, PNC Bank and contributing partners The DeMarco Wachter Firm and Gannon University SBDC. We are committed to supporting women business owners in their efforts to grow their businesses. Advised on action plans for marketing efforts for both their annual appeal and also for fundraising events and awareness of the needs of the ship. Past Committee member of Scott Enterprises "We Promise to Care"
Active with both Erie Regional Chamber and Growth Partnership and Visit Erie. This conference explored the integration of new technologies in distribution services offering a higher perspective on communication needs through the implementation of intelligent systems and though informed delivery capabilities to enhance direct marketing campaigns. This conference explored the critical connection between marketing strategy and recruitment. The annual Carnegie Conference is a must-attend event for recruitment marketers. Industry-leading experts explain how to use today's top marketing strategies in student recruitment plans and tell your story. With interactive sessions, actionable breakouts, and expert speakers, the conference touches upon the marketing mix of traditional and digital tools that can make campaigns successful. National conference on student recruitment, marketing and retention. Each year the conference attracts more than 1,500 campus professionals, providing excellent opportunities to interact and network with your colleagues in higher education and to prepare for emerging trends and identify an effective roadmap for strategic planning in today’s changing environment. This training included a comprehensive review of Project Management methodology and implementation. Effective Prospecting, Building Relationships, Respectful Workplace, Coaching, Communication & Interpersonal Skills - Enhancing Your Leadership Style, Ethics in the Workplace and Marketing. All course work completed. Thesis incomplete. "Kristine is an extraordinary individual that exemplifies the qualities attributed to an individual that exceeds. Due to her positive attitude and commitment to excellence ATHENA Erie continues to thrive. Kristine is most definitely an individual you want on your team!"